The Memphis Corporate Appeal has an article on the announced CREDO study of charter test scores for urban areas, including Memphis and Nashville. 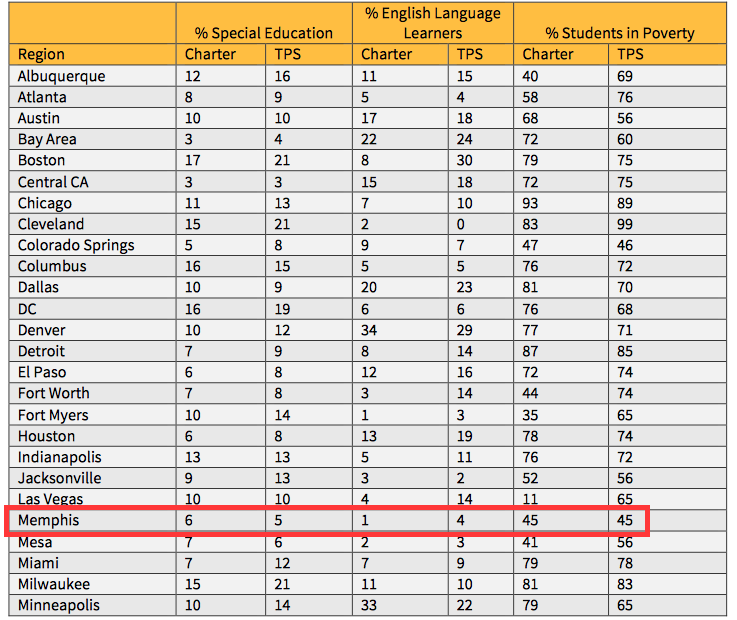 The data are from 2006-2012, even though the charteristas in TN and other venues that show higher scores are pretending as if this is new and up-to-date data. For Tennesseans, the first thing to notice is that these numbers show test score comparisons from before the time that the ASD brought its special formula for failure to Memphis and Nashville. Secondly, the report shows charter schools with a larger percentage of special education students than the public schools (6% and 5%). This is absurd on its face. The real percentage of special ed kids in Shelby County is 20 percent, and it higher than that in the remaining public schools in Memphis. The same situation prevails for the "student poverty" numbers, which are based on kids qualifying for free and reduced price lunch. CREDO shows public school students who qualify at 45 percent, when the real number is over 70 percent for free lunch and nearly 80 percent for reduced-price lunch in public schools. We have to wonder what else CREDO got wrong in its Walmart sponsored research. The CREDO report, of course, does not acknowledge other charter advantages for churning out test scores, which include longer school days, year-round test prep, brutal behavioral systems, 70 hour teacher work weeks, self-selecting parents, funding advantages from corporate and hedge fund donations, dumping of low performers and other "bad" students back into the public schools, little or no back-filling of lost students, and fewer males students. Given all these charter advantages and the state of total demoralization in public schools serving poor kids now targeted for future shut down and conversion, how could charter schools not show a test score advantage of some kind? ?